New Brunswick Border, Fundy National Park to Alma on the Bay of Fundy. We entered the Province of New Brunswick in light rain coming in from the north from Province of Quebec close to Edmunston on the morning of the 28th of May, 2011. We stopped at the local visitor information centre, where a friendly crew greeted us as we walked in the door. New Brunswick is the only province or territory that is truly bilingual, both French and English are official languages. New Brunswick - Quebec Border. As we drove south through wonderful landscape we soon came across a well known name, "McCain". I'm sure we all have had some fries from McCain. We soon came to our next stop, the town of Hartland with it's world famous, "Longest Covered Bridge in the World" 1282 feet long. Hartland is a wonderful little town with a beautiful setting. If you come through this area, this is a place you really should go and visit. We camped in River Country Camping, on the St John River outside Clearwater, south of Perth-Andover. A really nice place to spend the night. We went for a walk after supper and guess what? A flat tire. A screw was "screwed in to the tire". Not sure where we picked that one up. I had my tire kit with me, and put in a "plug" (just like in the tire shop) and used my litle compressor to fill the tire. I did not even have to remove the tire to fix it (and at present, the 15th of June, the tire is still holding). Liz was breathing a big sigh of relieve. We realized that this little $20 dollar repair kit and $50 compressor is a must if you go on a long trip. Next day we again were amazed with the picturesque landscape we drove through. We entered the capital of New Brunswick, Fredericton. We stopped only briefly and went on our way. City Hall in Fredericton, NB. From Fredericton we drove east on the Trans Canada and then south on Highways # 10 and # 114 through Fundy National Park. This park offers tons of hiking trails, from easy to challenging. Go and see for yourself and enjoy the forested and varied landscape. 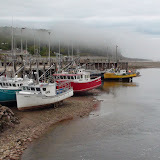 Our next stop, just south of the park, was the little town of Alma on the Bay of Fundy... This place is picture postcard quaint. Bring your easel and camera. Here we picked up some "Sticky Buns", a local specialty at the bakery and some freshly cooked lobster.... the lobsters cought in the Bay of Fundy are some really big crustations, like a small dinosaur. More Lobster for supper ? We set up camp at Ponderosa Pines Campground in Hopewell Cape, right on the Bay of Fundy. We had site number 133 with the best view of the water. It is right next door of the UNESCO Heritage site, "Hopewell Rock" with its unique rocks washed out by the tides of the Bay of Fundy. PS. More pictures on our Picasa Web Album. Click image below. Hartland NB has a very different look from the Hartland Landfill site near us here on the peninsula. More great photos and descriptions of what you are seeing. I like being an armchair traveller with you at the wheel. That covered bridge is fabulous as are those lobster. My mouth is watering; must be supper time! Every campsite seems to be well equipped and beautifully situated. no need to be uncomfortable and wear dirty clothes.